The pity is Labour supporters think Ed Balls scored a bulls-eye when he forced David Cameron to lose his temper at Prime Minister's Questions today when, in fact, he shot himself in the foot. Irritated at constant sniping by the Shadow Chancellor, the PM called him a "muttering idiot" and was obliged by the Speaker to withdraw the insult. The idea is if you goad Cameron enough, he will drop his guard and reveal his true bully-boy Flashman tendencies. It doesn't work. In the exchange Cameron's short fuse made him look human and Balls the schoolboy. If Labour leader Ed Miliband wants to be taken seriously as a government leader in waiting, he should make certain his No. 2 starts behaving as an adult. Balls was all at sea yesterday trying to turn the IMF's annual assessment of the economy into an attack on the Tories. Managing director Christine Lagarde said clearly Britain should have a Plan B in case the economic climate worsened any further. 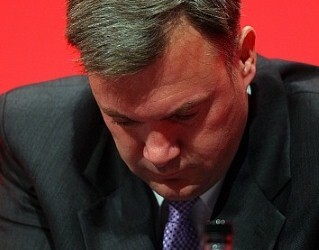 Balls told interviewers she had said Plan B should be in operation now. If the IMF report was so condemnatory, why didn't his leader mention it at PMQs? He wasn't Miliband's first choice but now he's stuck with him. Balls has to sharpen up his act not his tongue. If one agrees with the view that the previous government mismanaged the economy, where/when Balls was the chief economic advisor, then the term "idiot" is more than appropriate and is quite kind. 'Deregulated'and misguided "savant" comes to mind. When the PM uses the term "muttering idiot" to describe Balls, he really, really means it. It must have been the first time ever that the economy was 'run on empty'.